Stand-Up and Go starts this week! My newest comedy venture, Stand up and Go with Joel Fragomeni, starts this Thursday night July 14th at 10pm. This will be a weekly show at the Go Comedy! Improv Theater in Ferndale, Michigan. For those of you th at don’t know, Go Comedy! started a few years ago and quickly became THE spot for improv comedy in the Detroit area. There have been a few iterations of The Second City in Detroit over the years, the Comedy Castle had Totally Unrehearsed Theater on Tuesdays for years, and Planet Ant is still operating in Hamtramck, but Go Comedy! outclassed all of those in little time by providing a classy, friendly, professional environment for their performers and audience. If you attend a Go Comedy! performance you’ll find a very young, energetic crowd – the opposite of you’ll find most nights at a stand-up show, open mike or otherwise. It’s with this energy and environment that I hope Stand-Up and Go will become THE show in Detroit for veteran and new comics alike. A place to explore new material, meet other comics on the scene, and generally have a good time. 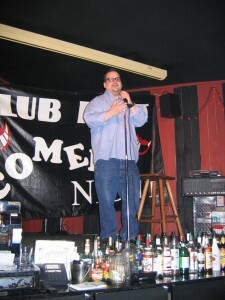 I know most of you know I hosted Club Bart’s Comedy Night for over a decade. I loved Club Bart and I tried to make it as open an accessible to anyone who wanted to perform, whether you were a veteran or a first-timer. I would like that spirit to continue at Go Comedy!, however there are going to have to be restrictions on stage time that I didn’t have at Bart’ s, so right now I am only booking a fixed number of comedians on the show. As of this writing, the first two shows are completely full, although there is always a chance of a cancellation. So if you are interested in performing, please come to the show to lend your support. A spot may even open up on the night, you never know. I don’t have a set-in-stone way of making the list for this show yet, but those who show enthusiasm and support will be given opportunities. There is also going to be a $5 cover to attend this show, but you can get a free pass right here. The first show features an excellent line-up which, right now, looks like this: Myself hosting, Matt McClowry, Jeff Scheen, Martin Butler, Michael Soave, Harry Artin, Matt Gulley, Jeff Horste, Leola Stafford, Ron Taylor, Mike Lundy, Eric Thomas, Jeff Arcuri and Bill Bushart. Please come out and support this show! It’s gonna be good! To anyone that’s known me for the last twelve years or so, you’ve known one thing – I spent every Thursday night at Club Bart, a restaurant and bar in Ferndale, Michigan. Every Thursday night. OK, I went on the road a few weeks a year, but aside from that, every Thursday was spent at Club Bart. The reason – comedy night.